10/1-7 ~ Last Quarter Luna Among the Winter Stars and More! Note: For those living in San Francisco this New Moon takes place below the eastern horizon 3.25 hours before sunrise. The Sun, New Moon and planets are located in the same constellations for other parts of the world; these constellations, in differing time zones, lie in a different location above or below the horizon. The Sun and New Moon lie in the constellation of Leo the Lion between Regulus, the Lion's heart star and Denebola the tail star. The Sun and New Moon also lie between Mercury in the constellation Leo and Saturn in the constellation Virgo. Above (north) we find Ursa Major (the Great Bear) and its Big Dipper asterism. Mizar at the bend of the Big Dipper's handle influences the new lunar cycle. Review map above. Leo aligns humanity with the Law of the Soul and therefore with our essential divinity, the True Self. The energy of Leo’s sickle-shaped asterism, forming the Lion's head and heart, helps us cut through confusion and clear out anything hindering the application of the Spiritual Law, the expression of the Christ consciousness, the quality known as love-wisdom. When Mercury lies in Leo the Lion, creative powers are very strong for those tuning to the soul. Mercury remains in this constellation through September 30. The seven stars of the Great Bear's Big Dipper are esoterically known as the Seven Rishis and correspond to the head centers in the body of a Great Being. Each of these stars transmits a ray of energy into our solar system. These seven rays are the givers of life to all on this earth. The New Moon in Leo the Lion roars with the fire of Divine Will. This purifying fire brings the higher mind and soul into manifestation. It subjects humanity to the eternal flame that brings forth new life. The Law of Spirit with its quality of love-wisdom, and the joining of the head and heart heal any burn one might encounter. Creative powers are strong and fiery now. We are being divinely ignited in a baptism by fire and raw volatile energies are looking for creative expression. Use the Lion's sickle to cut through confusion and clear out what does not align with the integrity of the soul. Consider the Whole. Create patterns of interchange that foster synthesis and healing. Tap into the intuition for what truly "works" in life, that which creates an inclusive wholeness. Become the five-pointed star, the human ascending into its divine expression on Earth. Full Moon during Libra, begins with this New Moon. Soon after sunset on September 10th and 11th, Venus and the crescent Moon guide the way to some much more difficult sights. The visibility of faint objects in bright twilight is exaggerated here. These scenes are drawn for the middle of North America. European observers: move each Moon symbol a quarter of the way toward the one for the previous date. In the Far East, move it halfway. BTW: You'll need right timing and an unobstructed horizon to see this sunset skyscape. The Sun sets around 7:30pm. Generate exact times for your area. we too grow in the light of our Soul. Overcoming obstacles to the new incoming awareness begins with the waxing Crescent Moon. What was conceived at the New Moon, Baptism by Fire, (review above) is now in the process of waxing or gestating. September 10-11, Friday-Saturday, slender Crescent Luna activates the shapeshifting triangle of Venus, Mars and Spica found in the constellation of Virgo the Virgin. With or without Luna these two planets and brightest star of Virgo continue to brew an evolutionary elixir within the Virgin's celestial chalice and therefore within humanity. As this potent potion percolates, the passionate driving will of Mars the warrior is unifying/cooperating with the understanding creative wisdom of Venus the goddess of Love; both are being imbued with divine qualities from on High, and the hidden essential divinity of humanity is purposefully being midwived into manifestation. Spirit's creative fires are indeed burning within! As above so below. Libra requires a point of balance where neither spirit nor matter dominates. Zubenelgenubi is a star that has the potential of stimulating the fires of revenge or repairing a relationship. Choose up by healing a wounded relationship. This spiritual balancing act requires yielding on all non-essentials and finding common ground. Note: Tuesday, September 14, look for Luna in the day sky. She is low in the southeast at 3:00pm and due south at sunset. For those in the Pacific Time Zone, First Quarter Luna is bound to be "half-Full" and colorful as she sets low in the southwest around 11:00pm. Her First Quarter phase is exact 9/14 at 10:50pm PDT (05:50 UT 9/15). Luna and the cosmic Scorpion are fanning the flames of our baptismal fire and activating the transformative power within us. Scorpius tests us to reveal our illusions, when these burn away our consciousness expands. Luna is asking us to be Firewalkers, to "walk on fire" and purify our lower mind through the use of solar fire, higher mind, the soul consciousness. Feel the Scorpius sting or burn? Call upon Ophiuchus the medicine man. September 15, Wednesday, look for First Quarter Luna growing Gibbous in the day sky. Today she's low in the southeast at 4:00pm and low in the south from 7:00pm-9:00pm. Luna lies near the top of the teapot asterism of Sagittarius. Constellation Image Nearby, lies Pluto and the New Horizons Pluto-bound spacecraft! Learn more with this Map/Text. The cosmic Archer Sagittarius, with Pluto upon his bow takes aim, zeroes in on the Light and Truth and knows the way to go. His emanations illumine the useful intellect, allowing intuitive perception to see a new type of goal, one that unifies the dualities into a Divine re-union. Aim the arrow of the mind toward the intuition. Jupiter and Uranus at Their BEST! Jupiter near the circlet of Pisces has a planetary companion, blue Uranus. 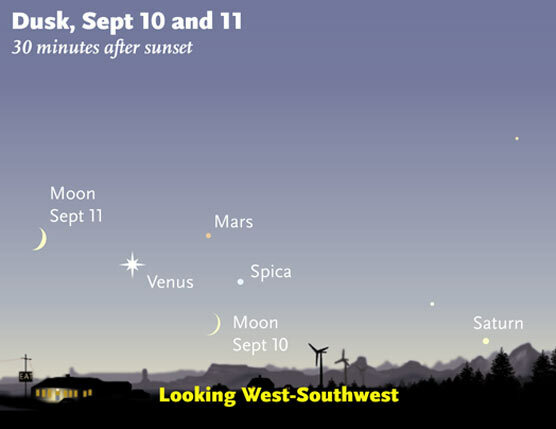 Both planets at opposition are at their closest, biggest and brightest Tuesday, September 21. However, one will not notice any decline in their appearance a couple of weeks after this date. Uranus normally telescopic can now be seen with the unaided eye in a dark sky! September 22/23 marks the autumn equinox, which occurs during the sign of Libra (9/22-10/23). At this time the Sun is located in the western part of the constellation of Virgo the Virgin, at the head of the Virgin. Autumn Equinox Solar Point This year Jupiter and Uranus, positioned at the circlet of Pisces, are opposite the autumn equinox point. They are near the Vernal Equinox Solar Point during the autumn equinox! Check out this 9/11 Star Map; click its constellation icon to see an image with annotations. The Harvest Full Moon is exact Thursday, September 23. However there are 5 Harvest Full Moon nights, September 21-25. During this time one can participate in an International Peace Day Vigil, a Full Moon global meditation and several autumn equinox global meditations. Click Harvest Moon to learn more. Note: Be sure to look for the striking diagonal line-up of the Harvest Full Moon, Jupiter, and Fomalhaut our Southern Royal Star located in Pisces Austrinus. Fomalhaut travels alone close to the southern horizon. Click the following link. 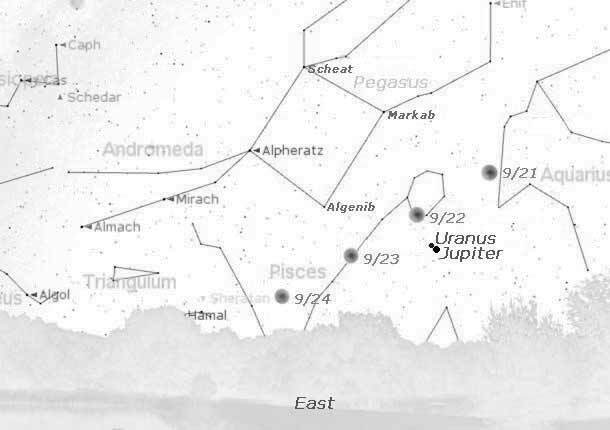 Jupiter and Uranus, in close proximity to each other with an exact conjunction September 18/19 are also in a close approach to Earth, reaching opposition September 21. This portends a strong, joint planetary effect upon our lives. As a friend of mine says, "if you could express the qualities of this pairing in two words it would be BIG CHANGE." Expect surprises and sudden opportunities, as well as the feelings to express youthfulness and freedom. Jupiter and Uranus are located in the dim constellation of Pisces, the constellation of the World Savior. It is interesting to note that Pisces, lies beneath the Great Square of Pegasus, which the ancient Babylonians called "The Doorway to Paradise." Review map above. Today astronomers travel through this doorway or "window" to the edge of our Milky Way Galaxy and go beyond to other galaxies!. Likewise, the Doorway to Paradise opens, and new dimensions of reality are experienced, when the Light of the World, the World Savior, frees humanity from subservience to the form, ending forever the darkness of matter. We are reminded of the Christ consciousness, humanity's essential divinity, the awakened heart and soul. Jupiter is brilliant and illuminating in this celestial position, for it is the brightest light in the night sky after Venus sets. The giant planet is ultimately bound to be light for our world, expanding our hearts and minds. The call to humanitarian service is strong with Jupiter in Pisces. In this location Uranus also sheds its light upon our world by surprisingly shifting humanity into a new reality with new visions of the greater whole, freeing us from the outdated, limited form-life. This lunar cycle reminds us of the purifying baptismal fire, which brings the higher mind and soul into manifestation. We are above all else the Children of Fire for within us is a peculiar quality which burns and destroys all that hinders our essential divine expression. The Full Moon is exact September 23 at 2:17am PDT (09:17UT). This is just 6 hours after the September 22 equinox. Clarity of Purpose Global Meditation During Libra. Wednesday, September 22 at 9:00 pm PDT (04:00 UT 9/25). What was conceived at the New Moon, Baptism by Fire, review above now comes to fruition and is birthed into the full light of our conscious minds. The Full Moon resides in Pisces, the constellation of the World Savior. It transits Algenib the wing star of Pegasus the Flying Horse, north of Jupiter and Uranus. Review map above. Humanity, as the World Savior, is inspired to rise up by riding the wings of the soul toward the guiding Light and through the gates of Paradise (The Great Square of Pegasus). The Full Moon during Libra is illuminated by the Sun positioned in Virgo the Virgin near Saturn. Libra is the point of balance in the zodiac, where spirit and matter maintain a poised equilibrium. Libra demands we walk the razor edged path of balance, the path of the soul and the awakened intuitive mind. Virgo nurtures humanity's inner seed of divinity, so that it may grow and emerge, ultimately giving birth to the HU - man being * , a God - man, a Christed ONE on Earth. The Sun positioned in Virgo bestows the forms that can demonstrate a consciousness having a greater sense of the whole. Saturn positioned anywhere in Virgo the Virgin conceives the structures that exteriorize the unfolding Christ consciousness. The Full Moon's illumination supports the whole, all of who we are, and guides us toward a balanced manifestation of spirit and matter. Solar fire not only lights up this Moon; solar fire is giving birth to Homo luminous and its new creative forms and structures. As one season ends and another begins much of humanity will be looking up toward, and aligning with the light of 5 Harvest Moons and an extraordinary Jupiter in conjunction with the now binocular Uranus. Sunset Venus at greatest brilliancy will also be catching our eyes and hearts! In addition much of humanity will be in meditation for International Peace Day, the Full Moon and the equinox! All this looking up, going within and lunar / planetary impression is bound to create BIG CHANGE in our world. The alignment of the Sun, Earth, Moon, Jupiter and Uranus is occurring with the shift of the seasons and the Harvest Full Moon. The Sun lies at the autumn equinox point, while the Full Moon, Jupiter and Uranus lie at the spring equinox solar point. 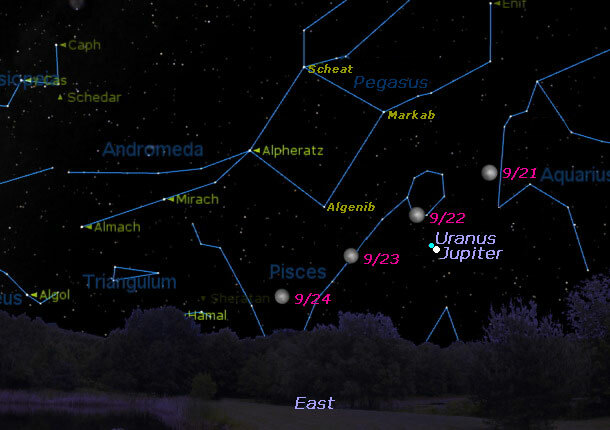 A new 13.5 Jupiter-Uranus cycle begins with this current conjunction. The previous one began in March 1997. This lunar cycle and its Full Moon help us integrate the whole of who we are in a baptism by fire. As Children of the Fire we are reminded to balance matter and spirit, the personality and the soul. The Libran Way governs the razor edged path between polarities. When spirit and matter, light and dark interact it is our compassion that unites them in right relationship and poised equilibrium. If we are successful in this balancing act, our harvest will be full, nourishing and serve the greatest good. When we make earthly challenges heavenly opportunities for At-One-Ment, we tread the path; we become the path. With each step we save and transform our world. We fly with the wings of the soul, experiencing new dimensions of reality. The Soul rises and remains! What can you identify before and after midnight? Note: The view of the sky appears to move west 15°/hour *. View the whole sky at different times. Last Quarter Luna rises at 12:00am October 1 and by 2:15am appears low in the east as shown in the sky chart. It is positioned in the constellation of the Gemini Twins, within the Great Winter Hexagon, north of the Winter Triangle. Luna and the "kool" winter stars move westward as the morning unfolds. They can be seen overhead just before dawn's early light. Look any morning for the winter stars. Orion's 3-star belt points to our brightest star, Sirius, in the South and reddish Aldebaran, the eye of illumination, to the north. The Big Dipper in the north guides us to Polaris our North Star in the Little Dipper. Just after sunset the Big Dipper is located in the northwest, just before sunrise in the northeast. Mira, a variable star in the constellation Cetus, changes in brightness during the year, making it visible or invisible to the unaided eye. Mira, reaching maximum visibility in early October, can now be viewed without an optical aid. Look for this variable star east (left) of Jupiter 11:00pm to dawn. Jupiter also guides us north to The Great Square of Pegasus the Flying Horse and south to Fomalhaut our Southern Royal Star. Fomalhaut, Jupiter and Algenib of Pegaus diagonally line-up. The normally telescopic Uranus, in close proximiity to Jupiter, can now be seen in a dark country sky with the unaided eye; use binoculars for easier viewing. Eye-catching Jupiter is in the east at sunset, due south around midnight and low in the west about an hour before sunrise. The Summer Triangle lies overhead around 8:00pm and low in the west around 2:15am as shown in the map above. Look for its Northern Cross (Cygnus the Swan) standing upright on the western horizon between 2:00am - 4:00am. Vega, the triangle's brightest star, lies opposite Sirius, the brightest star in the heavens. Vega sets when Sirius rises. Catch the last morning glimpses of Mercury. The Last Quarter Moon can bring a crisis in consciousness as the Moon squares the Sun. This cycle's experiences have culminated and one must now prepare for rebirth by initiating change. This lunar phase is exact September 30 at 8:52m PDT (03:52 UT 10/1). The Gemini Twins though opposites, innately cooperate for the benefit of the whole. Castor the mortal twin represents the form. Pollux, the eternal twin representing the spirit, is associated with the fulfillment of the soul's greater evolutionary purpose. The Gemini Twins are a sacred union of the earthly and divine fires within; these "twin flames" unite as one in the heart. Together they are and do something greater than either can alone. Last Quarter Luna journeys between the Gemini stars, Mebsuta and Wasat. Review this Constellation Image and the sky chart above. Mebsuta, the knee star of Castor, means treading under feet. This relates to triumphant Castor the mortal one. With his heart ablaze, he transforms evil into good and overcomes death because of the sacred covenant he has with his divine twin. We too can establish a sacred bond with our divine twin, and in daily co-creation, share in the glory of Heaven on Earth. This lunar cycle's baptism by fire (review above) is now requiring that we initiate change, one that unites the "twin flames" of spirit and matter within a cooperative heart. This requires effort and an aspiration to unify the soul and personality. The Gemini Twins and Last Quarter Luna are giving rise to this heartfelt human effort. The time has come to create a cooperative spirit in the world, to celebrate diversity, to set hearts ablaze with goodwill, to establish right human relations. This lunar cycle is ending. Be reborn. Transform evil into good. Shine on Homo Luminous! October 7, Thursday, a New Moon occurs at 11:44am PDT (18:44 UT). Stay tuned for the next edition of Moon Dances.